Ununtrium, Flerovium Ununpentium, Livermorium Ununseptium, Ununoctium And then we’re done!! The Norwegian physicist Lars Vegard may have been the first to propose electron configurations for all the chemical elements, from hydrogen to uranium, on the basis of quantum atomic theory. 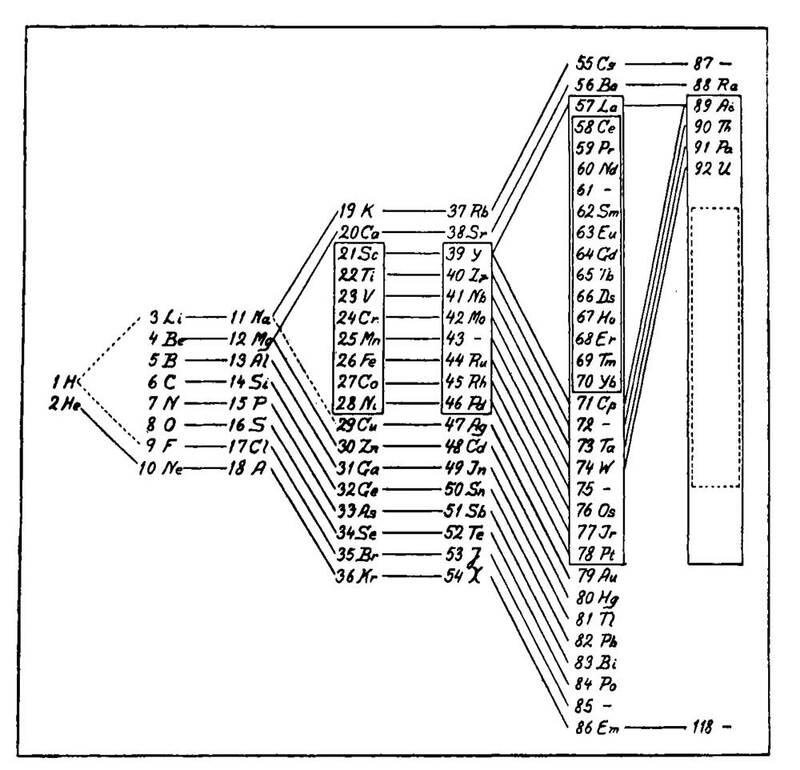 This he did in papers of 1918-1919 in which he argued that the principal quantum number corresponded to the shells in Bohr’s picture of atomic structure. 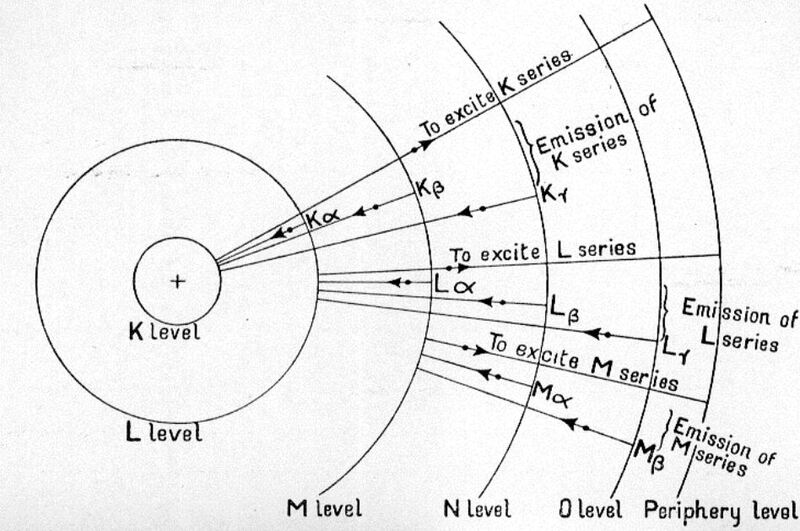 Vegard’s theory of the periodic system, based on the methods of theoretical X-ray spectroscopy in particular, was a significant advance but exerted little influence on the further development. It presupposed atoms made up of planar electron rings, and with the abandonment of the ring atom about 1920 this and similar models lost their credibility. 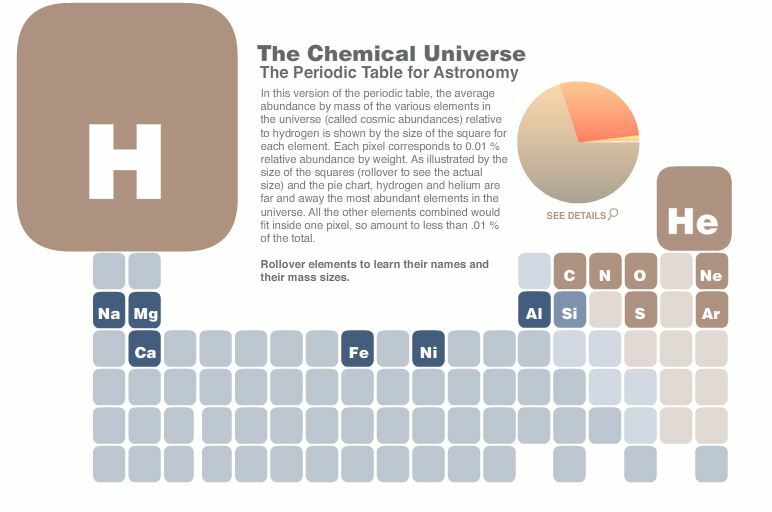 To illustrate this connection, the familiar periodic table of elements—found in virtually every chemistry class—has been adapted to show how astronomers see the chemical Universe. What leaps out of this table is that the simplest elements, hydrogen and helium, are far and away the most abundant. The Universe started out with baryonic matter in its simplest form, hydrogen. In just the first 20 minutes or so after the Big Bang, about 25% of the hydrogen was converted to helium. In essence, the chemical history of the Universe can be divided into two mainphases: one lasting 20 minutes, and the rest lasting for 13.7 billion years and counting. After that initial one third of an hour, the expanding Universe cooled below the point where nuclear fusion could operate. This meant that no evolution of matter could occur again until stars were formed a few million years later. Then the buildup of elements heavier than helium could begin. 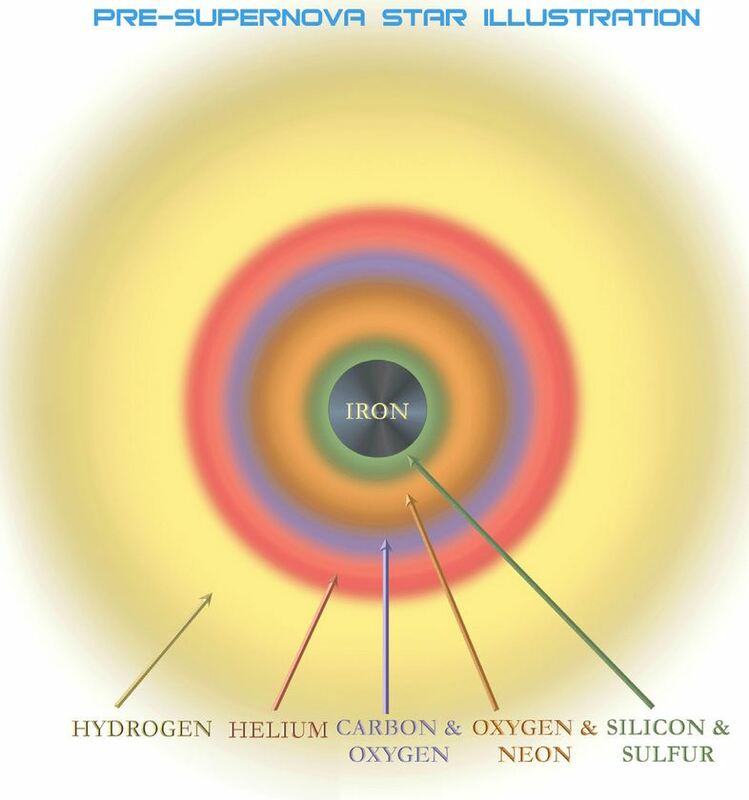 Stars evolve through a sequence of stages in which nuclear fusion reactions in their central regions build up helium and other elements (see illustration, above).The energy supplied by fusion reactions creates the pressure needed to hold the star up against gravity. Winds of gas escaping from stars distribute some of this processed matter into space in a relatively gentle manner and supernovas do it violently. The chemical composition of the Universe has been constantly changing throughout its 13.7 billion year history. As the enrichment of the interstellar and intergalactic gas has proceeded over vast stretches of space and time, the chemistry of the cosmos has become richer, too. 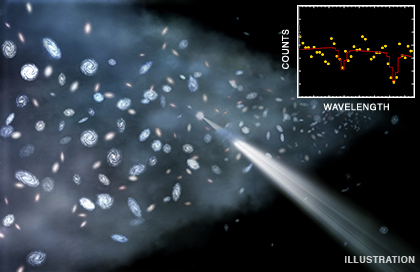 Subsequent generations of stars have formed from interstellar gas enriched in heavy elements. Our Sun, Solar System, and indeed the existence of life on Earth are direct results of this long chain of stellar birth, death, and rebirth. In this way, the evolution of matter, stars and galaxies are all inextricably tied together and so too are astronomy and chemistry. 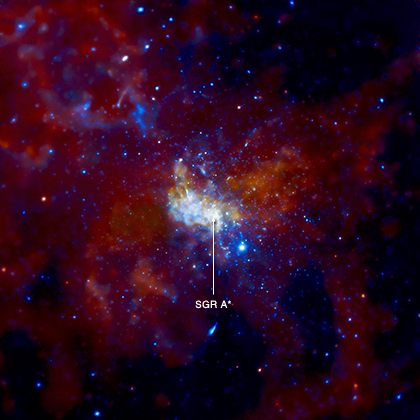 One of the principal scientific accomplishments of the Chandra X-ray Observatory has been to help unravel how the chemical enrichment by stellar winds and supernovas works on a galactic and intergalactic scale. 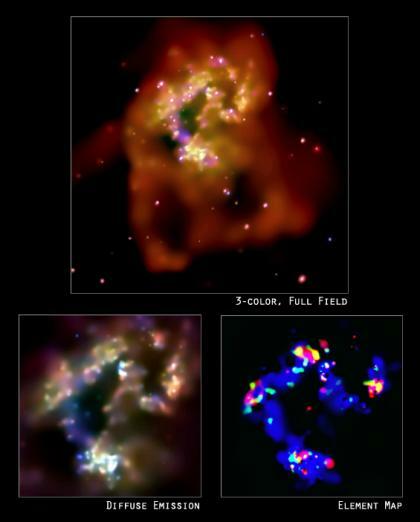 Chandra images and spectra of individual supernova remnants reveal clouds of gas rich in elements such as oxygen, silicon, sulfur, calcium and iron, and track the speed at which these elements have been ejected in the explosion. 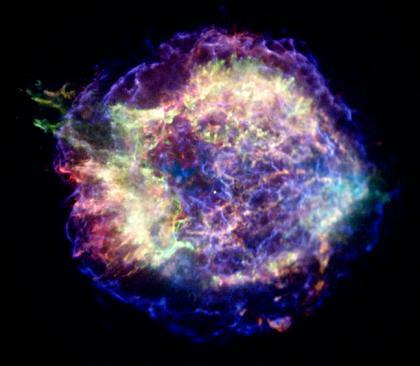 The Chandra image of the Cas A supernova remnant shows iron rich ejecta outside silicon-rich ejecta, thus indicating that turbulent mixing and an aspherical explosion turned much of the original star inside out. Observations of Doppler-shifted emission lines for Cas A and other supernova remnants are providing three-dimensional information on the distribution and velocity of the supernova ejecta which will help to constrain models for the explosion. An unexpected agent for distributing heavy elements throughout a galaxy is a supermassive black hole in the center of a galaxy (for example, Sagittarius A*). Gas spiraling toward black holes can that become overheated and produce a wind of gas that flows away from the black hole, or it can create an intense electromagnetic field that drives enriched material into the outer reaches of the galaxy and beyond. On a still larger scale, oxygen has been detected in intergalactic filaments millions of light years in length. This oxygen was likely produced more than ten billion years ago, in some of the first supernovas to occur in the history of the Universe. If the rate of supernovas gets so high that the combined effects of many supernova shock waves drives a galactic-scale wind that blows the gas out of the galaxy. A prime example is the galaxy M82. 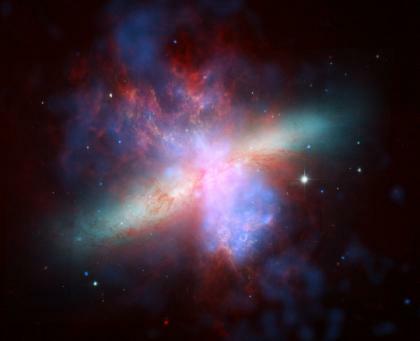 Galactic winds such as the one in M82 are rare today, but they were common billions of years ago when galaxies were very young and stars were forming rapidly because of frequent collisions between galaxies. Chandra showed that the Sculptor Wall, a collection of gas and galaxies that stretches across tens of millions of light years, contains a vast reservoir of gas enriched in oxygen from galactic winds. The Sculptor Wall is thought to be part of an enormous web of hot, diffuse gas containing as much as half of all the ordinary matter in the Universe. 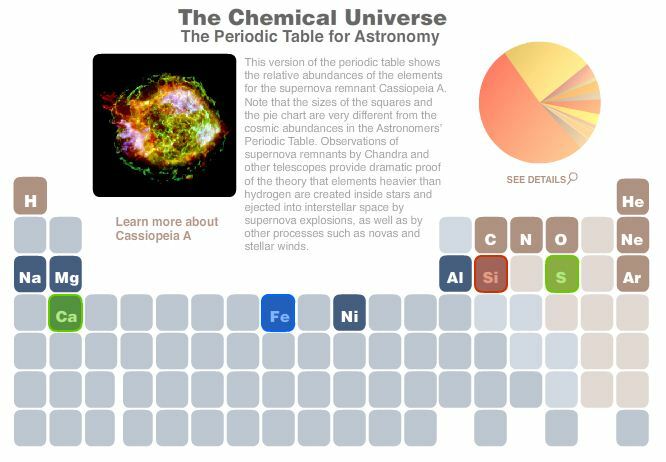 In this version of the periodic table, the average relative abundance by mass of the various elements in the Universe is indicated by the number in the square, which gives the abundance in parts per 10,000. The sum of the abundances of all the elements without numbers is less than one part per 10,000. The abundances give important clues to the nuclear reactions and cosmic settings required to produce the various elements. Evidence for the existence of the two elements, the heaviest yet to be included, has been mounting for several years. A number of research teams had claimed to have produced the heavy elements by smashing together the nuclei of lighter atoms. But it took a three-year review before they received official status. The teams behind the discoveries will be invited to suggest names for the new elements, and unless particularly outlandish requests are made, they are likely to be accepted. An announcement is expected soon. In the meantime, the International Union of Pure and Applied Chemistry (IUPAC) has assigned the elements the names ununquadium and ununhexium, derivations from their atomic numbers of 114 and 116, respectively. Also considered were claims for discoveries of elements with the atomic number 113, 115 and 118 – but the report of the Joint Working Party for the Discovery of New Elements, made up of representatives from the Union of Applied Chemistry and the Union of Applied Physics, dismissed the evidence for these as not strong enough. Heavy elements tend to be radioactive, as their atoms have many more neutrons than protons and so decay quickly. There would seem to be no practical use for an element which is stable for less than a second before decay, but it moves research closer to developing elements with 120 or more protons. Nuclear theorists think these super-heavy atoms might remain in a stable condition for several decades and exhibit useful chemical properties. Plutonium, with an atomic number of 94, is the heaviest naturally occurring element. All the elements heavier than this, including Einsteinium, Rutherfordium and Californium, have been produced synthetically and decay rather rapidly.